I had printed off a poster of events that happened in 1960 on 11 x 17 paper in preparation for my husband's 50th birthday and took it home on the train. Because I did not want to bend it, I held it in my hand and ended up sitting beside a gentleman on the train who saw the poster and shared with me what he received on his 50th birthday, which was the chocolate bar birthday card. Well, the years have certainly passed through your BUTTERFINGERS. 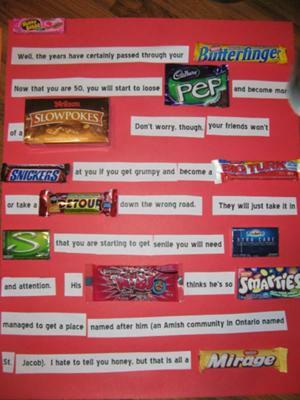 Now that you are 50, you will start to lose PEP and become more of a SLOWPOKE(cross out "s"). Don't worry, though, your friends won't SNICKER (cross out "s") at you if you get grumpy and become a BIG TURK or take a DETOUR down the wrong road. They will just take it in STRIDE that you are starting to get senile and will need XTRA CARE and attention. His NIBS thinks he's so SMARTIES managed to get a place named after him (an Amish community in Ontario named St. Jacob). I hate to tell you honey, but that is all a MIRAGE. Hitting 50 has turned you into a bit of a FLAKE. I'll stick around, though, because after another decade goes by, you will become even more of a TURTLE and may need OXYGEN (actually HALLS brand that has the word "Oxygen" on it) and a CANE (candy cane) to keep on going. How you managed to stay so THINS beyond me as you EAT MORE than I do. While I, on the other hand, stopped counting the pounds AFTER EIGHT registered on the scale. Some people BELIEVE it has something to do with the fact that men are from MARS, while women are from Venus. and a little TWISTED and brag about MR. BIG. What can I say but "Oh my." To add anything else, I won't even try. Yes, they say, "women still FANCY ME" and they attempt to WISPA sweet nothings in their ear. You always EXCEL at everything you do whether it's building something from PIECES of wood or painting the HALLS. Suffice it to say, you are WUNDERBAR! I'd say our family is like the 3 MUSKETEERS. We have been blessed with a lot of BOUNTY, and life with you is always a BLAST. You always go that EXTRA mile and do things just to make us feel SPECIAL (Hershey Special Dark). Cupid's AERO has brought us together and WERTHER (cross out 's and the word "Original") you are old or grey, you will always SKOR high marks with me. I could not have found a better friend or husband had I searched the whole MILKY WAY. This birthday wish is sealed with a HUG (Hershey Huggs) and a KISS (Hershey Kisses) for each year we've been together. This chocolate candy bar card for husband's 50th birthday took up 3 posters. I printed the words in 50-size font and cut and pasted as need. I figured if I had hand written it, it would have taken up even more posters than the 3 I used. I took these pictures before I crossed out the respective letters and added punctuation like periods after certain chocolate bars. 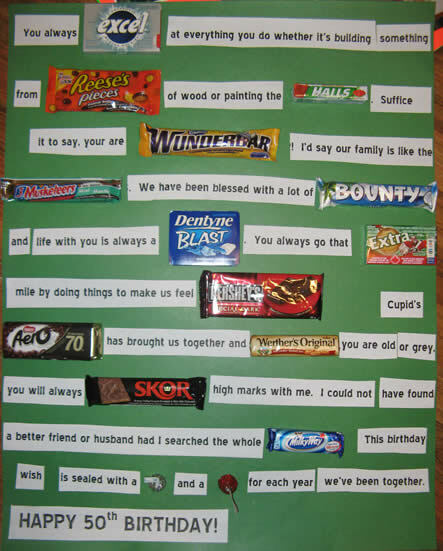 Do you have photos of the other two pages of the chocolate candy bar card for husband's 50th birthday? If so, email them to me at angie(at)chocolate-candy-mall(dot)com and I'll add them to this page so everyone can see the full effect. I'll bet Jake just loved it. Was he as impressed as I am? P.S. Elaine DID send me the additional photos, so I've added them here for you all. :) Aren't they great?! Husband's 50th Birthday Card Was A Hit! 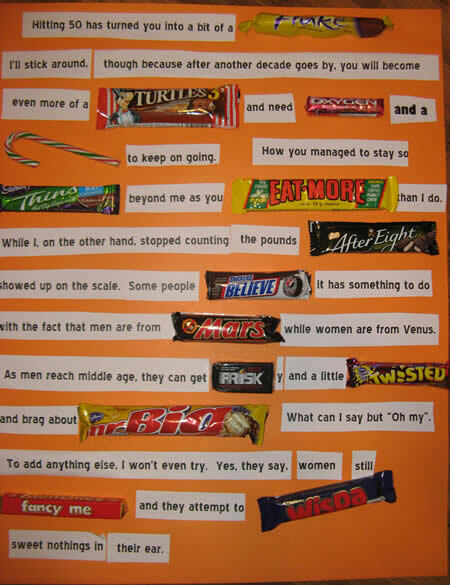 My husband really loved his chocolate candy bar card as did everyone else who as at the party. I tied the candy bar cards all to the railing of our landing to the second floor ahead of time and then just covered it with a sheet so that when I unveiled it, it was all there for everyone to see. I had Jake read it out loud to everyone and they all had a good laugh! My 10-year old son has been chomping at the bit to help my husband eat his way through all the chocolate bars.